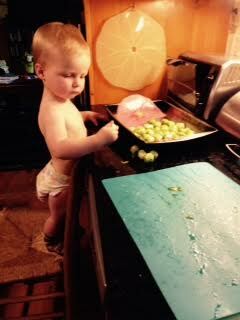 My 17-month-old grandson helps with the Brussells sprouts preparation. He was curious about what I was doing, so I included him. It’s never too early to get kids started contributing around the house. With all of the busyness of the school year, summer can offer some open-ended time to catch up on family meetings and re-establish a routine of chores. Kids thrive upon routines. It’s not too late to establish one for the summer. Have a family meeting and ask the kids what outings they want to take this summer. Challenge them to think of some free and local adventures, like walking up a creek in old sneakers. Ask them what jobs they household jobs they want to take on for the summer. Encourage them to reach a little beyond their ability if they offer. For example, a nine-year-old can capably prepare a very simple dinner that uses prepared foods. When his/her family appreciates the food and effort, that is high encouragement and motivation to do it again. When I was about 10, my mother assigned me the job of making dessert for the family, because all of the other jobs, like making dinner, had been taken by my eight other siblings. Most of them were older and it seemed like I could never catch up. I had a great deal of fun experimenting with homemade desserts. My mother rarely complained about the mess I made and was willing to pay for any ingredient. In those days, I hopped on my bike and rode a half-mile to the A&P to buy whatever was needed. The result? I love to bake desserts and the confidence spilled over when I learned to cook other foods as well. I can still remember the feeling of satisfaction of contributing to our family’s dinners. Summer is another opportunity to establish the routine of family dinners or at least breakfast together. Such connection, influence and closeness cannot be found anywhere else, or so conveniently, right in your own home. Move the meal outdoors if you can. My oldest daughter remembers, “Having dinner in front of the fireplace on the coffee table in winter made me SO happy.” Kids are easily pleased. Cherish that while you can. My book on chores offers more information on how to chores can teach your kids grit, self-confidence and self-discipline while using the effective tools of family meetings. It’s available on Amazon in Kindle and paperback. “Raising Able: How Chores Empower Families” by Susan Tordella. There are plenty of stories of mistakes I made and successes, too, so it’s light summer reading. One of the main things I learned about chores from surveying 500+ people ages 8 to 90 was the reason they did chores was simple: “My parents expected me.” Money is one of the lowest motivators for people of all ages. According to Daniel Pink, author of “Drive,” the most powerful motivators are mastery — learning something new and doing it well, autonomy — having freedom and choices over a task; and power — control or influence over a situation or people. Most of what we parents do is free and is expressed through our body language and our actions. Our kids are always watching us. Get going today and set up a family meeting and talk about chores and family fun. Remember to encourage their input and give them the opportunity to run the meeting. I'm putting nets around Purple Loosestrife to grow beetles to kill other loosestrife. I just read “Drive: The surprising truth about what motivates us” by Daniel Pink. I was so impressed by the book that I included some of his ideas in the next edition of my book, “Raising Able: How to retire as the family servant,” about how childhood chores are a valuable teaching tool. Pink says money is the LEAST motivating factor, even though it is the most commonly offered reward to influence the behavior of others. Mastery, autonomy and purpose are the strongest motivators of people and primates, according to research, Pink reported. Researchers were astounded to find monkeys puzzling over puzzles long after the rewards were consumed — for the sheer challenge of figuring out the puzzles. It’s the same with motivating children, spouses, employees, co-workers and friends and neighbors. People want to work for mastery, autonomy and purpose. When people are given the freedom [autonomy] to do a job right [mastery], they can connect to the purpose behind the task, according to Pink. So it is with children, who also like to contribute to the family good because it proves their family depends on them, they are important and they belong. 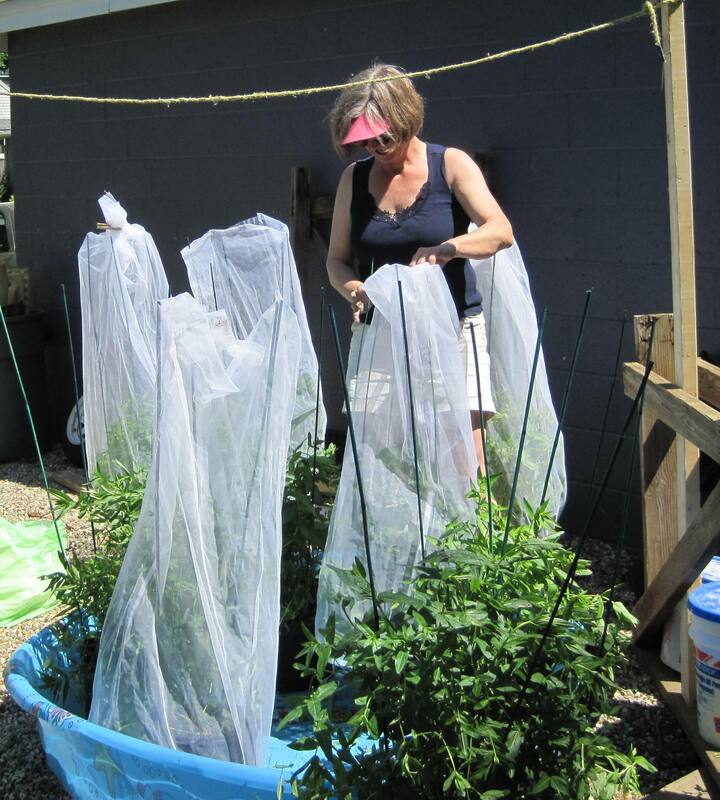 You’re asking, “Why the loosestrife photo?” It was a thankless job with several complex steps to grow a crop of beetles on it [hence the nets] that will reproduce. In six weeks, I’ll deliver the next crop of beetles from under the nets to a waterway clogged with loosestrife and I’ll have done my part to eliminate this invasive species. What motivated me? Mastery — it was complex; autonomy — no one was making me do it; and purpose — I’m helping the environment. Now I need a glass of iced tea and an hour in the hammock.